Prolonged intravenous therapy versus earlytransition to oral antimicrobial therapy for acute osteomyelitis in children. Transfer to serving plate and dustlightly with cocoa powder or spread with ganache(recipe follows). Address: Ag.Loukas 65404, Kavala, Greece. The IABL2016 Conference Opening will take place in the Main Amphitheatre. The main hall has a capacity of 400 persons and the foyer – 120 persons. The pre-conference workshops (April 22nd, 2016) will take place at Windows-1 and Windows-2 Labs with a capacity of 22-25 persons. You can take a virtual tour of the campus. Select “Kavala’s Points of Interest”. From the drop down menu select “Amphitheatre Entrance” (Opening of the Conference). Transportation to Kavala should be arranged by taxi (average cost of 35 -40 euros) or you can contact the IABL committee to arrange an alternative transportation if possible. KTEL MACEDONIA offers about 15 connections to Kavala daily. There is no need to book it in advance. There are two possible routes. The slower option (2.5 to 3h) via mountains leaves on the hour. The faster option (approx. 2h) via Nea Peramos has 4 departures daily (9am, noon, 3pm and 6pm). Fare for a single one-way ticket is 15€. Flying to Athens: Athens airport “El.Venizelos” offers air connections to Kavala’s airport “Megas Alexandros” http://www.ypa.gr/en/our-airports/aia. There are also regular bus connections from Athens to Kavala. Please contact organizers if you require an invitation letter for the visa purposes. For the most part, electrical sockets (outlets) in Greece are one of the two European standard electrical socket types. Please check the following websites for details. Opening hours from Monday to Friday : 7:30 – 14:30 – Closed on Saturdays and Sundays. The weather in Greece in September is warm and mild. Average temperatures in Kavala for September range from 19 to 29°C. 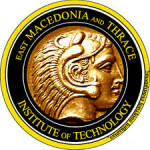 The Technological Educational Institute of Eastern Macedonia and Thrace (TEI EMT; Greek: Ανώτατο Τεχνολογικό Εκπαιδευτικό Ίδρυμα Ανατολικής Μακεδονίας και Θράκης, ΑΤΕΙ ΑΜΘ; formerly Technological Educational Institute of Kavala, Τεχνολογικό Εκπαιδευτικό Ίδρυμα Καβάλας, TEIKAV) is a public institute providing university-level education in Eastern Macedonia and Thrace. The institute has three campuses; the main campus in St. Lukas, Kavala, and additional campuses in Drama and Didymoteicho, Evros regional unit. The TEI of Kavala had 13,500 registered students in the academic year 2007–08, ranking seventh among the 16 technological educational institutes in Greece in terms of students. The TEI of Kavala was founded in 1976, and its current form is a result of many institutional reforms and changes. Originally established as an educational centre for vocational studies under Presidential Decree 748/76 and Law 652/70, it was recognized in 1983 as an institute of technology by Law 1404/83. In 2001 it was upgraded to a higher educational institute by Law 2916/01 and since 2007 it is recognized as a university-level institute. However, the term "university" is not widely used, because the term "technological educational institute" (TEI for short) is more common throughout Greece. EI of Kavala’s facilities were originally located in leased buildings around Kavala. In 1992 these facilities relocated to the new main campus in St. Lukas. Developed by Michaniki S.A., the campus buildings were arranged in an amphitheatre-style structure, overlooking the gulf of Kavala. The campus area is approximately 132,000 square metres (1,420,000 sq ft) with buildings covering 36,000 square metres (390,000 sq ft). TEIEMT is the main sponsor of the IABL2016 providing the conference attendees with access to the conference main venue.